Quark tastes good at any meal, at any time. Quark is also healthy. It is full of protein a vital building block we need daily to stay fit and healthy. It is loaded with minerals, including calcium, which is so important for bones and teeth. Combined with phosphor it controls metabolism, muscle, and brain activities. Even vitamins are in Quark. Almost all vitamins A for eyes and skin, and all vitamin Bs for nerves, heart, metabolism, and blood are present. Small amounts of carbohydrates in the form of milk sugar promote a good metabolism. The nutritional value of Quark is tremendous. Consumers love Quark. Nothing better then a mild creamy product without the sour taste of yogurt. Health conscious consumers keep on eating Quark. The nutritional content of Quark is hard to surpass. Only a few products offer such high protein content and versatility as Quark. Starting from adding chives, watercress, horseradish, paprika to cherries, strawberries, apples and all kind of other fresh fruits. Quark is also a favorite on whole grain breads. Low in fat and very tasty with fresh chopped herbs. Children love Quark with fresh fruits anytime. Quark (or qvark) is a fresh cheese of European origin. It is soft, white and un-aged, similar to fromage frais. It is not the same thing as cream cheese or cottage cheese. It is distinct from ricotta because ricotta (Italian: recooked) is made from scalded whey. It usually has much lower fat content (about the same as yogurt) than cream cheeses and has no salt added. Quark is traditionally made without the aid of rennet. In the United States the milk must first be pasteurized. Once the milk is ready, lactic acid bacteria are added in the form of mesophilic lactococcus (buttermilk) starter culture. Some or most of the whey is removed. Traditionally, this is done by hanging the cheese in flour sack towels and letting the whey drip off. In industrial production, however, cheese is separated from whey in a centrifuge and later formed into blocks. In Germany, Quark is usually sold in plastic tubs. This type of quark has the texture of sour cream, but is much dryer and contains in its basic form about 0.2 % fat. 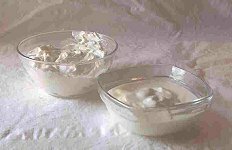 Quark with higher fat content is made by adding cream. Quark is often used as an ingredient for sandwiches, salads, and a kind of cake similar to cheesecake, called "Käsekuchen" in Germany and "kwarktaart" in the Netherlands. In these cakes, the quark is typically mixed with eggs, milk or cream, and sugar, and baked. Quark flavored with vanilla or fruit is used as a dessert. The name comes from the German Quark (first noted in the 14th century), which in turn is derived from the Slavic tvarog, (Polish twaróg, Belarusian тварог, Russian творог, Czech and Slovak tvaroh, and Hungarian tъrу) which means “curd”. Also called Schichtkдse in other parts of Germany. The Bavarina name Topfen has gone back as far at the 13th century. A Topf is a vessel usually used for cooking. Other German names are “Glumse” East Prussia, “Matte” Hesse, “Matz” Middle Germany, “Topfkäse”, “Bibbeleskäs” Baden, “Klatschkies” Rheineland, “Sibbkäs” South Hesse), “Luckeleskäs” oder “Luggeleskäs” Wurttemberg und “Weißkäse” oder “weißer Käs” Southern Germany. In Austria the name Topfen ("pot cheese") is used instead of Quark. Other Austrian names are „Schotten“ oder „Schottenkas“ (Kärnten). In Estonian, it is known as kohupiim ("foamy milk"). In Flanders it is called as platte kaas ("flat cheese"), while the Dutch use the name kwark. The cheese is also known simply as "white cheese" (Polish: ser biały, Lithuanian: Baltas sūris, Hebrew: Gvina Levana āįéšä ģįšä, Serbian: beli sir), as opposed to any rennet-set "yellow cheese". Quark is first described by Tacitus as lac concretum, "thick milk," eaten by Germanic peoples. Although common in Europe, manufacturing of quark is rare in the United States. A few dairies manufacture it and some specialty retailers carry it. In Canada quark (firmer East European variety) is available as "baking cheese".